At York Traditions Bank, a commitment to the York and Hanover communities is a part of who we are. We give back through our Associates’ time in volunteer hours and financially through philanthropic charitable donations. Since our inception, we’ve donated more than $1.2 million and thousands of hours of our Associates’ time in support of local, charitable organizations. Through Pennsylvania’s EITC program, we have contributed funding to area scholarship organizations (SO), educational improvement organizations (EIO) and/or pre-kindergarten scholarship organizations (PKSO). This funding is based on yearly PA state approval and contribution limits. Funding is only available for approved EITC recipient organizations. More information on the EITC program is available here. 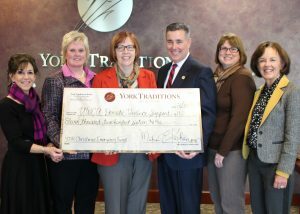 The York Traditions Bank community support committee reviews all requests on a monthly basis. Regional, National or International Organizations – Unless their programs directly impact the York/ Hanover communities. Want to make a request on behalf of your Organization? Click below to apply! Completed PDF and supporting documents can be emailed to communitysupport@yorktraditionsbank.com or delivered to any of our branches.